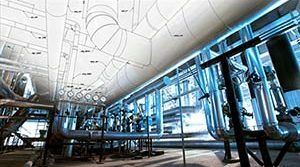 Compact Spring Supports Designed for a Pump Application in Wyoming | Piping Technology & Products, Inc. These compact spring supports were custom designed and built within 4 weeks to support a pump for a facility in Wyoming. The housing was fabricated from A-36 carbon steel and hot-dipped galvanized to protect them against corrosion. The disc springs are engineered using the stainless steel Belleville disc springs designed for large loads but small movements. In this case, the springs are designed to support a load of 11,137 lb. and movement of 0.018″ (upward). 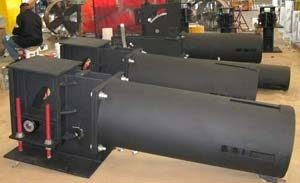 Each assembly underwent load testing prior to shipment. 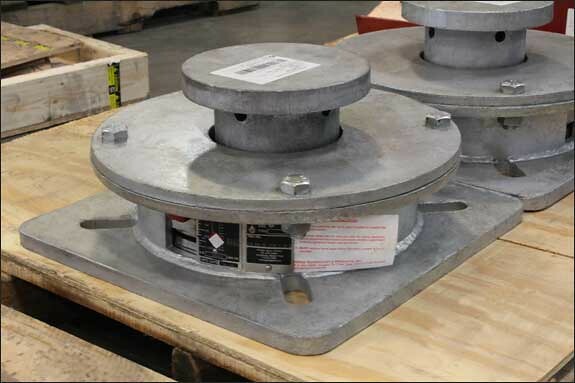 The compact size and resistance to corrosion attributes of these compact spring supports make them ideal for placement under the discharge piping of a pump at this facility. By using these compact spring supports directly on the pump, excessive thermal loading on the pump’s discharge nozzle is resolved and brings it within the pump manufacturer’s allowable limit, so the pump will operate safely, as intended which also results in extended life and low maintenance.